Fashion and embodied practices played a key role in regulating the gendered politics of subjectivity and belonging in Turkey’s formative years under the rule of the President Mustafa Kemal Atatürk (1923-38). In this period, vocational schools for girls, known as “the girls’ institutes” [kız enstitüleri], proposed a national style as an attempt to reconcile an imaginary European civilization and a constructed Turkish culture. To promote this style, the schools also organized the first major fashion shows in the country. In the Cold War Era, these shows gained a diplomatic aspect as they were staged in honor of political dignitaries visiting Turkey and to represent the country internationally. Over the years, both the institute style and diplomatic fashion shows have undergone multiple transformations, reflecting the broader political shifts on the national and global level. Nevertheless, these performances have continued to play a significant role in Turkey’s cultural diplomacy efforts, reflecting and reproducing new fantasies about gender and the nation. This talk will explore the history and politics of the national style developed by the girls’ institutes and the diplomatic fashion shows organized by the schools. This sartorial history reveals how the gendered definitions of the desirable citizen have multiplied and shifted in Turkey, and the role of fashion and performance in these processes. 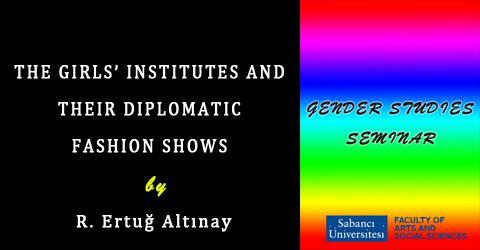 Using the diplomatic fashion shows as a vantage point, the talk will also investigate the intersectional politics of gender, ethnicity, and nationalism in contemporary Turkey as well as the historical background of these dynamics. Rüstem Ertuğ Altınay is completing his doctoral studies in the Department of Performance Studies at New York University. Altınay’s primary fields of research are the politics of gender and sexuality in Turkey, with a focus on feminist and queer performance and literature, queer historiography and archival practice, biopolitics, critical legal studies, fashion and material culture, visual culture, and Islamic sexualities. His essays have been published in peer-reviewed journals, including the Trans- and Fashion special issues of Women’s Studies Quarterly, Radical History Review, Transgender Studies Quarterly, the International Journal of Feminist Approaches to Bioethics, the Journal of Women’s History, and Feminist Media Studies. He has also contributed to collections such as Controversial Images: Media Representations on the Edge (Palgrave Macmillan, 2012) and Islamic Fashion and Anti-Fashion: New Perspectives from Europe and America (Bloomsbury Publishing, 2013). Altınay is currently preparing his first book manuscript, Dressing for Utopia: Fashion and the Performance of Citizenship in Turkey (1923-2015), for publication. He is also conducting research for a second book on queer historiography and archival practice in Turkey.